A general purpose compression sack is one of the most practical items to have on hand when properly allocating space in any pack. 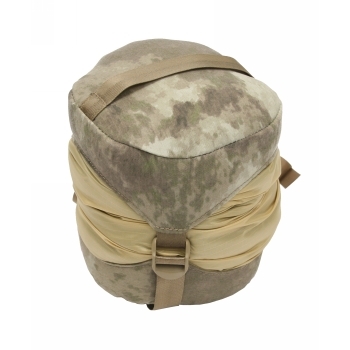 Tactical Tailor's Compression Stuff Sack is one part of the Fight Light line of products. While more on the "tactical" side of things, the compression sack is available in MultiCam and A-TACS Camouflage. This sacks are available in four different sizes from 16.25 to 24.25 inches. One may ask what purpose does this serve other than some good matching. Who really cares when Tactical Tailor offers a great price on all sizes and a well constructed compression stuff sack. Far be it from us to pass up the opportunity to have a camo match option when the opportunity presents itself. The sack is equipped with a drawstring cinch, and you can pack away to your hears content with a variety of items that compress down with three pull straps. It is always astounding at how much gear and clothing we can pack into these.